Do you know how easy it to make your own baby wipes? All you need is a few things you might already have around. 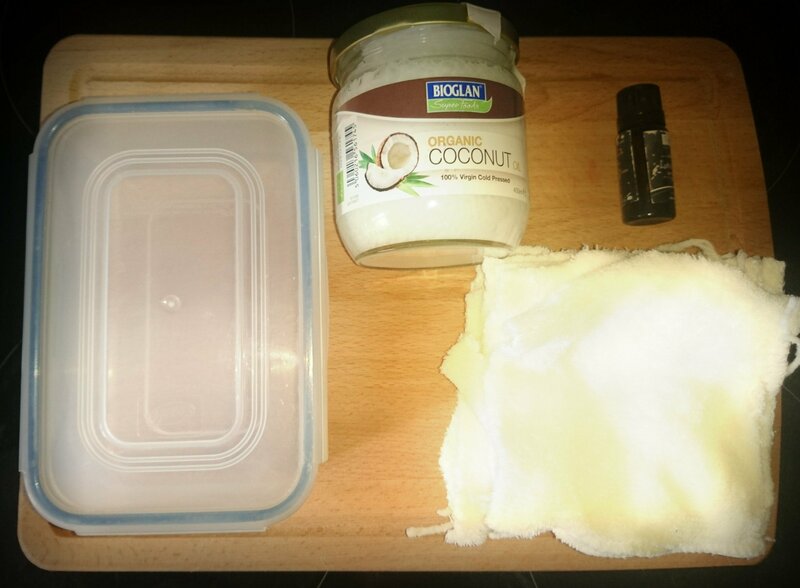 I use coconut oil, lavender essential oil, cut soft cloth and boiled water. It’s so easy and if your little one has sensitive skin it could be the answer to your prayers. In the past we tried different nappy rash creams that made my eczema on my hands really sore so God knows what it was doing to winnie’s little bum. Since we have used our own wipes, my hands and her bum are in a much better state. Winnie currently has Chicken pox which are particularly bad on her nappy area. There was no way I was putting baby wipes on her sore bits or giving her a bath with every nappy change. Thankfully you can make your own baby wipes super quick and know exactly what your putting in them. You need a tub with a lid, preferably glass but we just use a plastic clip pot. You will also need cloths or premade wipes like cheeky wipes. These are not the cheapest so we made our own. In good old poundland you can get super soft wash clothes for babies with 3 in a pack. I cut these in to 4 and put them on a quick wash to stop them fraying. Put a couple of drops of lavender oil and a about half a tea spoon of coconut oil in the tub and pour over water that has been boiled (still pretty warm). Then lay the wipes in one at a time until all soaked. You put the lid on and leave them to cool. That’s it! They will last for about 4/5 days and usually you will use them before the water needs refreshing. To wash them pop them in with your cloth nappies or if you don’t use them then just use a separate ‘dirty’ pot and wash them on a 50 degree wash with non bio powder and no conditioners. We use about 15-20 over 3/4 days. The best thing with these wipes is you get very skilled at using one wipe per nappy, even poops. You won’t be using any more than that unless it’s particularly explosive. You can use other essential oils to suit you but I just love lavender and it’s healing and antibacterial properties. Let me know if you give these a try, even if you just use them at home and disposable wipes when you go out!